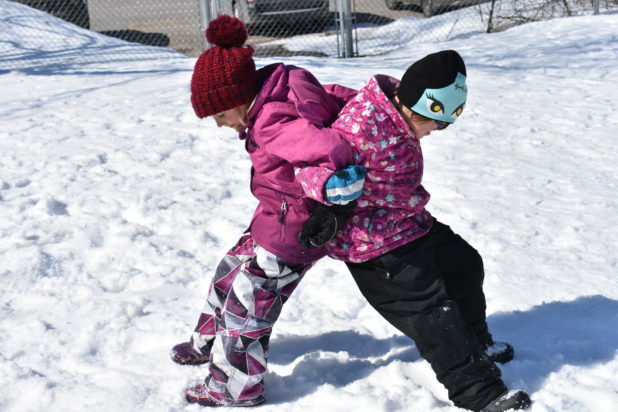 As the winter sun warmed the schoolyard on Wednesday, March 20, students of Maynooth Public School competed and played in a series of games designed to help them learn about history and culture and incorporate some physical activity, all while having fun. The students were divided up into 10 teams and were able to try each of the 10 events at least once during their afternoon outside. These events included learning how to snowshoe, toboggan pull races, blanket toss where students used a blanket to toss a ball in the air, lacrosse (which is Canada’s national summer sport), high kick where the students were challenged to kick a ball held up high on the end of a stick, a pushing contest where students stood back to back linked arms and tried to move the other person, the walrus walk where students had to pretend to be a walrus and crawl across the ground, the run and yell where they would yell as loud as they could and run as long as far as their scream would let them, a ball toss replaced the spear toss, and a game of hockey (which is Canada’s national winter sport) ended the stations. These games all tested the students abilities, just as they did when they were first created by the First Nations. They were designed to not only be fun, but build skills needed in that time. This event was a fun exercise in the students grade three Indigenous study curriculum, bringing history to life and outside the textbook.